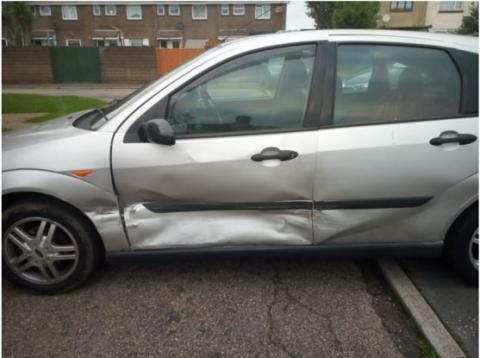 An appeal to ask members of the public to help us find a silver Ford Focus that was involved in a fail to stop collision in Shanklin, has resulted in the vehicle's recovery. Thank you to the members of the public who spotted the car and contacted us. It has now been recovered from a track near Sandown Airport. We are still appealing for witnesses to the collision which involved two silver Ford Focus's and occurred in Landguard Road, Shanklin, at around 6.37pm on Friday 28 December. The other Ford Focus was being driven by a 55-year-old man. His 25-year-old daughter was in the front passenger seat. Both were left shocked by the incident. The female passenger had to have hospital treatment for severe whiplash. PC Dominic Green, said: “I would like to thank members of the public who helped locate the vehicle. We are still appealing to anyone who might have witnessed this collision. "In particular, we would like to speak to a blonde woman driving a Peugeot 206, which is described as having sporty writing on the side. She witnessed the collision and stopped to check on the injured people." Anyone with information regarding this incident should contact Hampshire Constabulary on 101 quoting 44180480325. Alternatively, ring Crimestoppers anonymously on 0800 555 111.